We don't live on Welfare, but we spend HALF as much on food as people who do get Welfare. Recently, the food allotment went down to almost $500 dollars per month for three people. There are things we have learned through the years that could help others to get more for their money. For this reason, I decided to go ahead and start this series. I have a great desire to help others to learn to be self reliant and to live within their means. For years, I have done the $50 Grocery Challenge and recently I have done a Dollar a Day challenge, per person, for a family of four. That equaled $124 dollars for the month. Now, that was hard. But, people on Welfare get four times that amount and they aren't limited to the strict rules I used. I take the amount of money I have to spend for the month and divide it by the days in the month. Don't just divide it by four weeks. There are typically four and a half weeks in a month and you don't want to run short of money. So, if I have $500 for 31 days, that would give me roughly about $110 per week for a family of three. You get the point. Once I decide what I want to cook that week, I write down the ingredients I need to buy at the store that I don't already have. I also include lunches and breakfasts. If a healthy cereal is on sale, we may consider buying it. Most of the time, I make eggs, whole wheat toast, muffins, oatmeal, bagels, breakfast burritos, etc. I make 99 percent of all my bread, tortillas, etc. After my menu is planned, and I list the ingredients I need, I figure out about how much each item will cost. I also look at store ads to see if they have any of those items on sale. Many times I will check the store ads first and plan my meals around what I have as well as what is on sale. Once I estimate what I will be spending, I see if I need to change some things because they are too expensive, or make notes to myself to use less of an ingredient to make it last longer. The extra money I don't use will be spent on sale items that I regularly use. I can make tacos with just refried beans or use half of the cheese. I can skip the onion and celery in the soup. I can buy just a little bit of meat for the soup or skip meat entirely. I can use half the amount of hamburger in the taco soup. I can have oatmeal or whole wheat pancakes most days of the week instead of buying cereal. I DON'T GO OVER MY WEEKLY AMOUNT. If I have to pass something up, there will always be another deal around the corner. I estimate high so I usually have extra money after shopping. Sometimes I will put an item or two at the end when checking out. If I have enough money, I will get them; if not, I will just skip buying them. I don't have any surprises when I shop this way. I know about what I will spend and what I will get and don't make emotional decisions on the spur of the moment. Planning a menu and shopping list is one of the most important things to helping you to stay in your budget and make your food money last the whole month. If you have any questions, please feel free to e-mail me at mom@spendwise.org. I am happy to help anyone who would like the help. This was written just for me! 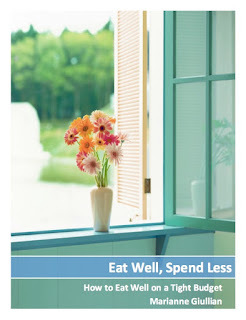 :-) I picked up a few new ideas that I think will help me this next month with my grocery budget. My goal is $300 a month for 2 people. The trick has been that we are eating low carb for health reasons. So, I am not able to stretch my money (as I did for many years) with grains. Last month I came in at $275 so I was happy about that. Thank you for sharing your plan.